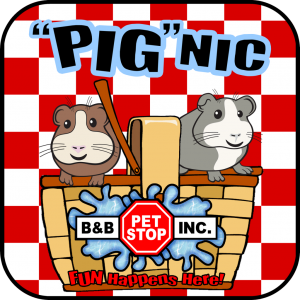 “Guinea Pig Grooming” – have your pet’s nails trimmed and learn the proper way to brush and bathe your pet. “Guinea Pig Treasure Hunt” – you’ll place your guinea pig on the picnic blanket, which is surrounded by lots of guinea pig hiding places. When your pet enters a hiding place YOU win a prize! Special prices on everything for your guinea pig – cages, toys, treats, foods, litters, hays – so if you need additional supplies, this is a good time to stock up. There is no cost to participate, but in order to get the free stuff, you have to BRING your GUINEA PIG with you!